Christmas nativity scenes in towns, churches, and front lawns usually contain a usual cast of plastic religious figures — Joseph, Mary, and baby Jesus, of course, curled up in a manger. Perhaps the three wise men with their gifts, some shepherds, a couple of angels. 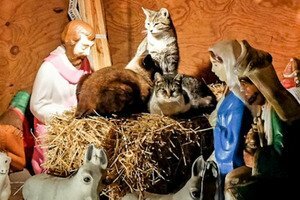 A group of feral cats have turned an Ohio homemade nativity scene into a “cativity” scene. If any animals feature in the display, it is usually a donkey, an ox, some sheep, and maybe the wise men’s camels. But a few animals are making headlines this Christmas week for adding themselves to their local nativity scenes. Last Friday, in the small town of Glendale, Ohio, someone noticed something unusual in their village square nativity scene: curled up in the hay near Jesus and his manger was a white and brown American Pit Bull Terrier. The Pittie was exhausted, injured, with wounds to his eye and one of his legs. Concerned about the dog’s condition, Glendale residents called town officials, who were able to secure the dog in one of their offices while searching for his owner. Glendale village administrator Loretta Rokey borrowed a kennel from a friend. She tells FOX 19 she knew it was important to get the injured pup to a veterinarian immediately, so she took the dog to Noah’s Ark Animal Clinic for treatment. While the Pittie received the medical attention he needed, members of the nearby rescue group Cincinnati Pit Crew (CPC) joined Rokey at the clinic, ready to take the dog into their care. CPC decided to give the dog a name befitting where he was found — Gabriel, after the angel who foretells Jesus’s birth. Because of the community’s efforts, Gabriel will now be able to enjoy the Christmas holiday at his new foster home. St. Francis of Assisi, both the patron saint of animals and the person credited with creating the very first nativity scene in the year 1223, would surely be delighted. Meanwhile, two Brooklyn sisters are getting a kick out of some feline additions to their family nativity scene display. Annette and Sue Amendola have been erecting their homemade nativity scene for more than a decade in a lot next door to their home. However, for the past few seasons, their display has became more of a “cativity” after a group of feral cats started nesting near the baby Jesus and his holy posse. “People love it, but they really get a laugh out of the cats,” Sue Amendola tells DNAinfo New York of the nativity. The kitties, including grey tabby cat Bandit, Bandit’s Sister, Blue Eyes, and four other unnamed cats, have set up shop in the small makeshift stable built by the Amendola sisters. The cats aren’t afraid to make themselves comfortable; in fact, Bandit has no qualms with pushing the plastic savior aside and napping on his hay bale manger. People have flocked to the Amendola’s block to catch a glimpse of the Christmas kitties, noting that they could actually be enacting a certain Biblical feline folktale. Tabbies are said to have gotten the ‘M’ marking on their foreheads for lending new mother Mary a hand that cold night after Jesus’s birth. As the chilly winds blew into the small stable, the infant Jesus started to cry. When Mary called to the stable animals to help her warm the baby, it is said that a small tabby hopped into the manger, snuggling with little Jesus to keep him nice and toasty. Mary, grateful to the kind kitty, bestows her first initial — the letter ‘M’ — on the cat’s small forehead as a token of her thanks. And it seems the Amendola sisters try to pay it forward to their kitty nativity friends all year long. Even after the holidays are over and all the lights and ornaments are stocked away, they keep the wooden stable open for their feral friends, giving them a warm place to rest. For more information about Gabriel, or to learn when the nativity Pittie will be available for adoption, visit the Cincinnati Pit Crew website and Facebook page. And if you’d like to check out photos of the Amendola sisters’ “cativity” scene, check out this slideshow on DNAinfo New York.